A National Academy of Sciences article describes a reusable, inkjet-printable lab-on-a-chip for point-of-care diagnostics that costs just $0.01. 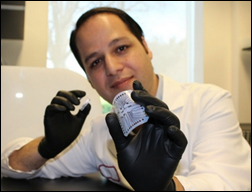 Heading the NIH-funded project is Stanford Genome Technology Center’s Rahim Esfandyarpour, PhD, an engineering associate who says inexpensive diagnostics could improve low survival rates in developing countries of conditions such as breast cancer, malaria, tuberculosis, and HIV. From Guacamole Greg: “Re: EHR. 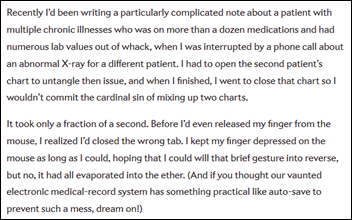 This doctor’s article says she inadvertently closed the wrong EHR tab and lost the note she was writing without warning. It fascinates me to what extent my colleagues view things like this as anything less than criminally negligent design errors. Still, I’m also amazed to the extent to which medical people don’t grasp the difference between structured data entry and word processing.” The doctor-author practices at Bellevue Hospital. She doesn’t mention the EHR she was using, although I assume QuadraMed since I don’t think they’re live on Epic yet. She bemoans the “special circle of hell created by cocksure computer programmers whose systems can incinerate hours of work” and wonders why EHRs don’t have a Word-like auto-save feature. Perhaps those who know common EHRs can answer the question – do the systems you know allow closing an entry screen without warning the user that they will lose their work? I think expecting auto-save is a bit much, but it’s reasonable to warn a user that their action is going to trash whatever they’ve entered but haven’t saved. The author had previously complained in a New York Times article that the EHR has a limit of 1,000 characters and she struggles to squeeze in lengthy notes. From Chris: “Re: VitalWare’s website. It’s been hacked again, with comments suggesting a different hacker. Any concern with PHI or customer data?” Not likely. Their public-facing website is running WordPress v. 4.7, which is getting hacked all over the place due to a REST API vulnerability. They really need to apply the 4.7.2 upgrade, which takes maybe 30 seconds and is unlikely to cause problems. Auto-updating of the WordPress core is enabled by default, I think, so perhaps they made the mistake of turning that off. In any case, it’s probably only WordPress that was hacked and that platform isn’t connected to anything sensitive on the back end – it’s just a website content management system. Healthcare’s most trusted data integration and compliant hosting company has a new name — Datica. Same trusted expertise; new and exciting moniker. The rebranded name better reflects the company’s emphasis on healthcare’s great challenge — a deluge of data to be integrated, exchanged, shared, and protected. Datica provides the ways and means for connecting healthcare. Check out the rebranded website www.datica.com, the new Twitter page @daticahealth, and make sure you stop by HIMSS booth #8152 for coffee or check this HIStalkapalooza sponsor out at their Datica cabana on the dance floor. Stopping by our HIMSS booth (#4845) on Tuesday, February 21 will be Industry long-timer and WebPT CEO Nancy Ham, who will offer career advice to women from 4:00 until 5:00 p.m. Saying hello to visitors from our microscopic booth on Monday from 1:00 to 2:00 will be Regina Benjamin, MD, MBA, the 18th US Surgeon General. Thanks to new HIStalkapalooza sponsors Clearsense (healthcare data science) and Hedgeye (financial and research media). I’ll have more about them later. Welcome to new HIStalk Gold Sponsor AssessURhealth. The company helps clinicians assess a patient’s health risk in several mental and behavioral health categories using a five-minute iPad survey that can be completed in the waiting room, after which the results are securely delivered directly to the EHR so they can be reviewed with the patient. Providers increase their revenue while screening patients for depression, anxiety, opioid risk, PTSD, and other conditions in raising awareness of mental and behavioral health. 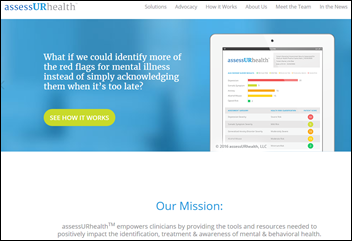 Thanks to AssessURhealth for supporting HIStalk. I found this AssessURhealth intro video on YouTube. Dear HIMSS-owned publication, sorry to be on your case again, but it’s really embarrassing that a publication dispensing health IT information can’t spell HIPAA correctly. Not that it matters since the JPP case had nothing to do with HIPAA despite your headline – ESPN is not a covered entity. Searching your site even turned up examples where you’ve spelled your own organization’s name incorrectly. Fake news! Sad! 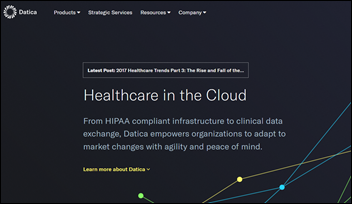 HIPAA-compliant hosting and integration services vendor Catalyze renames itself to Datica. I’m sometimes skeptical of a seemingly gratuitous rebranding, but co-founder Travis Good, MD explained that quite a few healthcare-related companies, incubators, and venture funds have used the name Catalyst as their service mark, observing that the Internet has made it hard to find a name that is securable and unique. There’s a good lesson there for newly formed companies – choose a name that is memorable, Google-able, and not already in use in healthcare, which is harder than it sounds (which is why new companies often prefer making up a word). Cloud-based patient matching system vendor Verato raises $12.5 million in a Series B funding round, increasing its total to $25 million. A Connecticut investment bank loses its bid to avoid paying $1.25 million to two elderly retirees to whom its broker sold shares of Nashville-based EHR implementation vendor iPractice Group in 2012. The Nashville startup shut down the following year. Physician staffing company TeamHealth will pay $60 million to settle charges that its hospitalists up-coded to create inflated bills as pressured by the company. Rich Walsh (Philips Wellcentive) joins Continuum Health Alliance as VP of business development. 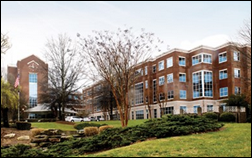 Novant Health (NC) chooses Glytec’s eGlycemic Management System for personalized glucose control in its 14 hospitals. 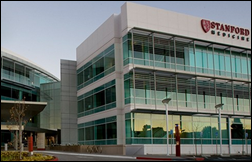 Oregon Advanced Imaging (OR) selects McKesson for revenue cycle management. Saint Francis Healthcare Partners (CT) will implement Orion Health’s Amadeus precision medicine platform. First Databank and Translational Software, Inc. will collaborate to develop pharmacogenomics-based drug knowledge that will provide clinicians with genomic-related risk information when prescribing drugs. BloodCenter of Wisconsin and Fresenius Kabi launch a pilot program at Children’s Hospital of Wisconsin that will use RFID to track and inventory blood products. InstaMed releases a secure token that allows providers and payers to accept online credit card payments without storing or accessing cardholder data directly. In surgery, the experience of the surgeon and the team are the best predictors of superior clinical outcomes. As you might imagine, given the huge volume of procedures his team performs each day, his hospital’s results are exceptional … clinicians use a sophisticated electronic health record they developed, with the information stored on an iPad. Unlike nearly all US EHR systems, the application is so intuitive that minimal physician or nurse training is required. The operating rooms themselves have huge windows leading to protected gardens designed to allow natural sunlight to enter and spur creativity. 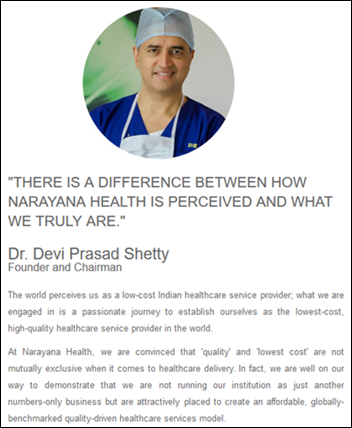 The bedside monitoring equipment links with a central computer system, allowing clinical leaders like Devi to measure each day how long it took a physician to intervene for a potentially urgent medical problem. In the United States this often exceeds an hour at night and on the weekend. In India it was eight minutes. 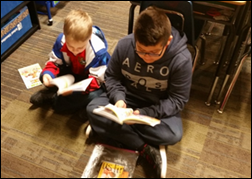 The disruptive innovation he has implemented isn’t just lower cost, it’s also higher quality. The hospital’s focus on people was widely evident. Embroidered on the white coats of doctors, nurses and staff was the question, "How can I help you?" Weird News Andy titles this story “Roach Nosetel,” where roaches check in but don’t check out – they get evicted. Doctors in India investigate a woman’s “wiggling” sensation in her nose following her unsuccessful visits to three other hospitals, finally identifying the problem as a full-grown, live cockroach that had made its way high into her nasal passages. They removed it, adding it to their list of successful nasal extractions in previous patients that includes beads, batteries, chalk, and a leech. The Sequoia Project appoints Medicity’s Brian Ahier to its board. Florida Governor Rick Scott honors Voalte Founder and President Trey Lauderdale for creating jobs in the state. ZeOmega’s Jiva 6.1 achieves ONC Health IT 2014 edition modular EHR certification from ICSDA Labs. ZirMed will exhibit at the Healthpac Users Meeting February 9-11 in Savannah, GA.
Agfa HealthCare and Telemedicine Technologies Company sign a memorandum of understanding at Arab Health. The South Florida Business Journal profiles Aprima Medical Software’s acquisition of Healthcare Data Solutions. CoverMyMeds COO Michelle Brown will speak at the Columbus Women in Technology event February 15 in Columbus, OH. Definitely Quadramed. We had been complaining about the lack of alerting when you accidentally close out a note for years from 2006-2008 but obviously the problem persists. No wonder H+H is going with Epic. Bellevue/QuadraMed. Criminally negligent design errors might be a bit harsh – I’ve seen just as many physicians complain about the extra keystroke it takes to click through a double dare. Regarding auto-save and the like, the question is where are you keeping the data and what that data means. You need to work through multiple scenarios, including the closing of a single window, an application timeout, or even the closing of the application itself. In each one of those cases, is it appropriate to either warn a user that there is an open transaction or to have saved off a local copy of the data within that transaction or to have stored it away on a server. If you choose to keep a copy on the server, what is the state of that data – it probably isn’t clinically valid, since it hasn’t been consciously accepted. Beyond that, if that portion of the note is never recovered, is it legally part of the medical record and discoverable. I’m guessing that the auto-saved data isn’t available to another care provider – but I’m not sure that in certain boundary cases, that the answer to that is 100% sure. There are rarely completely black and white design decisions – and at a certain point, you need to take some personal responsibility. I spend most of my work life with remote connections, on systems where VPNs and applications have timeouts, and sometimes the internet isn’t 100% reliable. Phone calls or other distractions happen in the middle of large projects, and depending on the applications involved (Citrix, Remote Desktops, etc. 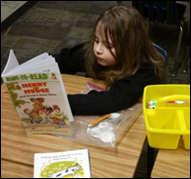 ), you can lose quite a bit of work if you lose concentration. My general rule of thumb is always, if you lose your connection, how painful is it going to be to recreate what you haven’t saved. If the answer isn’t “not very”, then save your work – especially if a distraction comes in. Dr Ofri attempted to not commit the cardinal sin of mixing up two charts. In this case, she did. Fortunately, she only lost work that could be recreated, and didn’t chart on the wrong patient. The simple solution for her would have been to take a second when the call came in, say “let me save my work”, then actually save that work, and then open up the new patient chart. And yes – I know – a serial answer in our multitasking world, nobody does this – but thinking that systems should save us from our own mistakes has its own risks. LFI Masuka: I don’t understand what “clinically valid” and “consciously accepted” mean. It may be wrong information, it may be right information, but it’s information. I’m no shill for Epic but I use it, and in Epic if you abandoned the work for any reason and didn’t sign it it will come back to you as incomplete work. At that point I’d rather have whatever I recorded at the time and fix it if I recognize a mistake than have nothing at all. I’m sorry, in this case there is a black and white design decision. You don’t destroy what the doctor recorded. Out of the four systems I know well, the two that lack auto-save and warning messages are both utterly awash in poor design. When I first got into the field, this blew my happy naive little mind… and it hasn’t really stopped, to be honest. Good choice to rename by Catalyze/Datica. Despite several personal interactions, I had been confusing them with a different company’s website/HQ location for months – which I’m only now realizing because of this post. Lost data and notes: Pathetic that there is not any central reporting of all the disasters caused by poorly designed and error facilitating EHRs. SAD!